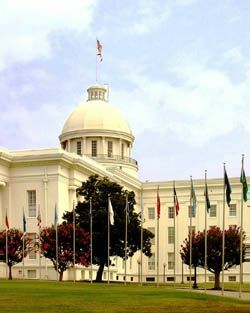 MONTGOMERY, ALABAMA--A substantial quantity of SymNet DSP and expansion devices have been installed at the Alabama State House in Montgomery, where they provide processing, auto-mixing, matrixing and distribution functionality for the legislative spaces. This installation is part of an audio/visual upgrade at the State Legislature building, which was designed by special systems engineering firm NBTA Engineers, of Baton Rouge, Louisiana. The House and Senate chambers at the Alabama State House in Montgomery are each identically outfitted with a SymNet 8x8 DSP hardware module together with 12-channel BreakIn12 and BreakOut12 expansion devices. The House and Senate chambers are each identically outfitted with a SymNet 8x8 DSP hardware module together with 12-channel BreakIn12 and BreakOut12 expansion devices. Principal inputs into each DSP matrix include microphones for the president and secretary (Senate) and speaker and clerk (House). There are provisions in the House for eight additional mics to be introduced into the SymNet system. The House/Senate Joint Briefing Room includes a similar complement of SymNet devices plus an additional BreakIn12 unit for external audio sources such as CD, tape cassette, broadcast and digital subscription radio, a two-channel wireless as well as lectern and debate microphones. The DSP and I/O units are interfaced with the CobraNet distributed audio network through a series of seven SymNet CobraLink audio and control data bridge devices located in the House, Senate, House/Senate Joint Briefing Room, Ways and Means and Finance and Taxation Committee Rooms, an eighth floor computer center, and at the distribution system head end. Outputs from the system feed the chamber speakers as well as the press feeds, assisted listening system feeds, tape recorder, transcription system feeds, and a feed for the Lieutenant Governor's office. "During final project closeout, the user/owner frequently desires modifications to the system. Accommodating the owner on these changes is significantly easier with a DSP-based audio processing system," reports Traylor.